Did you know 90% of information transmitted to the brain is visual? The brain also process visuals 60,000 times faster than text and studies have shown 40% of people respond better to images than plain text. It is clear that people respond to images. Lets look at an example. If I describe a “small, domesticated carnivorous mammal with soft fur, a short snout, and retractable claws”, I would be describing a cat. If instead I simply show you an image of a cat, you would understand I was describing a cat immediately. This is why visual content is so important. Why are Images Essential to Your SEO Strategy? High quality content is key for organic visibility. Lately, we have seen Google prioritize the image blocks in the SERP, going from position three to position two or even one in most countries. Images are here to stay and they are an important component of a good SEO strategy. Visuals grab the attention of search engines; as well as the attention of users. Images allow you to boost your search engine rankings and generate engagement from the users. They also play an essential role in conversion rate by reducing your bounce rate and increasing the time users spend on your website, which are two Google ranking factors. 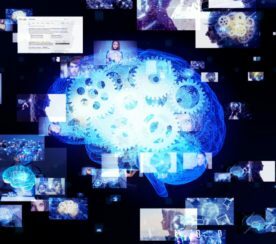 To get insights on real users’ search behavior and help businesses increase their chances of being visible on Google, Hoosh Technology, my employer, in collaboration with IDSIA (a world-renowned research institute for Artificial Intelligence) has put together a search behavior community. To achieve high-quality results, all participants share their genuine online search behavior, completely anonymously, with the end goal being of providing marketing professionals with a visibility score based on real user behavior. This data was taken from the Hoosh Search Behavior Community. What Did We Learn From This User Community? In the searches analyzed, images were overall not the most frequent content type in Google. In fact, images are less frequent than videos. It may be due to the fact that there can be only one block of images in a SERP; while there can be multiple video results. But when it comes to the first position in the SERP, after classic text results, images are more frequent than videos and other content type. In fact, 70% of all image results are within the first five positions in the SERP. This means that Google pushes images up the SERP, because Google is aware users like images! 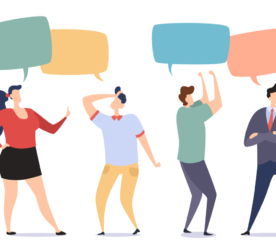 Even though images are not the most frequent content type to appear in the SERP, they get more clicks from the users within the community than videos, forums, news, maps, etc., thus generating more traffic than other content type. From my early findings, I noticed users click on images more than they click on other organic content type (after classic text). By analyzing the Google Image page, we noticed that 35% of people scroll down the page, which is twice as much scrolling as on the SERP. In other words, images will bring you some visibility and traffic even if they are not at the top of Google Images… but being within the first four images would increase your chances of getting noticed. These numbers could be revealing some insights about the future of search behavior. 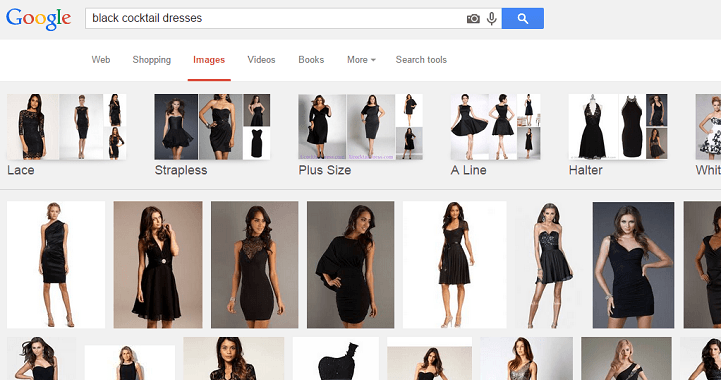 Imagine this: a Google user is searching for “black cocktail dress”. 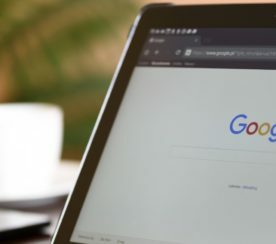 He/she would no longer need to visit each clothing retailers’ website, but simply shop directly from Google Images, scrolling down the images to find the desired item. Can you see this being a normal behavior in the future? According to my initial findings about Google Images, 63% of all users who click on images on Google Images then visit the website. On Google Images, the first image on the top left racks up 17% of all clicks, while the second image gets 7.9% of clicks, and the third and fourth each received about 5% of clicks. The CTR then drops to 1% at the 9th image, and crumbles down below 1% after the 20th image. Of course, these are only initial findings, and I will come back for more once a larger amount of searches have been analyzed! Optimized images can also improve your rankings in Google. Here’s an example: In a blog post on our site, Dorothy Wheeler explains there are two sides to visibility: a domain being present and available to be seen; and that same domain actually catching the user’s eye when they are searching. She then gives an interesting example how lingerie brands are missing out on a great image SEO opportunity. When Dorothy did a search for “push-up bras” on Google, the first organic results on the SERP were big players such as Victoria’s Secret and La Senza; however, these famous brands did not show up in image results on the SERP. On the other hand, smaller websites succeeded in optimizing their images with good SEO practices so that Google would “push” them higher up in the results (pun intended). Once your images are optimized, you will generate more traffic over time. In fact, 60% of consumers are more likely to click on a business whose images appear in search results. So generating traffic is good; but generating relevant traffic is even better! If you use unrelated pictures on your website, just as a matter of decoration, visitors who searched for a completely different content than what you actually offer will just look at the image, leave, and probably never come back. This means that you have attracted irrelevant visitors. Don’t just simply use images for decoration! As explained in this interesting article by Elisa Gabbert on Wordstream, the author once illustrated a post with an image that was not really related to the general content of her blog, and she attracted visitors who were just interested in the image she used. Once they got what they came for and realized the blog was not all about the particular picture they searched for (in this case, a picture of Jeff Bridges) they never came back. Sometimes, however, users are actually looking for information or products that can be represented visually; and this is your opportunity to attract relevant traffic by optimizing your visual content! The Eyetrack III research released by The Poynter Institute observed several dozen people for one hour as their eyes followed mock news websites and real multimedia content. Here are some interesting patterns they noticed: the eyes most often fixated first in the upper left of the page then hovered in that area before going left to right. A review of the 25 largest news websites reveals 20 of them place the dominant homepage image in the upper left. This means that users will look at the images before the text! What’s more, the research showed that clean, clear faces in images attract more eye fixations on homepages, and people often clicked on these photos, even if it ended up taking them nowhere. According to Social Media Marketing Blogger Jeff Bullas, on an e-commerce site, 67% of consumers say the quality of a product image is “very important” in selecting and purchasing a product. Furthermore, customers think that the quality of a product’s image is more important than product-specific information (63%), a long description (54%) and ratings and reviews (53%). So don’t neglect images – they are strong selling points for your products online! Once you’ve created great images to use and optimize for your website, nothing keeps you from using this visual content on social media. Au contraire, it’s well-known that images are easier to consume, and generate more social media engagement (shares, likes, and comments) than posts without a visual! Make sure to use images relevant to your content (beware of your decorative images that may drive the wrong traffic). Optimize your images for people and for search engines. Use file names relevant to the image and to the content of the page. Use descriptive ALT text and use keywords in the alt text, the image name, the page title, and in the text around the image. Images grab the attention of the users and the search engines, which makes them an important part of a good SEO strategy. To get better rankings and more traffic, boost sales, and also have social media content ready, every company should use and optimize images. How important are images to your business? Do you use and optimize your visuals? Are there any image optimization tips and insights you would like to share? Featured Image: Screenshot taken 06/11/2014 of www.Google.com.